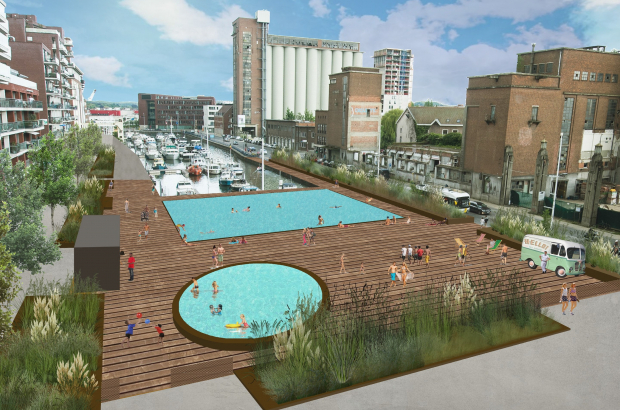 Leuven plans to break ground on a new open-air swimming pool by next year. The pool will have a prime location at the end of the Leuvense Vaart, the starting point of the Leuven-Dijle canal, in the north of the city centre. Following two years of concept development, advice and now approval by Flanders’ waterways agency, the project is beginning to take shape, according to city councillor Mohamed Ridouani (SP.A). The 25x25-metre pool would be sunk into the canal between Vaartkom and Havenkant. “The water in the Vaart itself isn’t clean enough for swimming,” said Ridouani. “But it appears that a swimming pool is feasible.” The project would also include a separate children’s pool. The Vaartkom neighbourhood is the source of much urban improvement over the last few years, with the Vaartopia project seeing more green space and both renovated and new buildings taking over the former industrial site. The goal is to make the Vaartkom a hub of creativity and culture. The new swimming structure would be between the end of the Vaart and the Opek cultural centre, which borders the Keizersberg Abbey Park. The total cost of the swimming pools and related infrastructure is €5.3 million, and it is expected to be ready by the spring of 2020 at the latest.